function with comfort in order to ensure that you feel and look good. the skin and thus ensuring an upright and more confident posture. Feeling good about yourself always has a positive effect on others. A beautiful bra with the optimum fit makes the most of our feminine curves and helps us to look and feel more confident. Are you wearing your bra correctly? The middle piece should lie flat between the cups on the breastbone and should not stand out. If the cups are too small, then the middle piece will not sit flat on the breastbone. In this case a larger cup size should be selected. A correctly fitting cup should enclose the breast and allow the underwire to close around the bust. Should the breast curve out of the cup or be cut into by the cup, then a larger cup size is necessary. If the cup stands out or falls into folds, then a smaller cup is recommended. The under bust band offers the most important support for the bust. 80% of the weight is carried by this band. For this reason, the band should lie in a horizontal line without cutting into the skin and without slipping upwards at the back. If the back of the bra pulls upwards, then choose a smaller size otherwise the weight will be taken by the straps. This could cause back problems. The straps of the bra should capture only 20% fo the weight which can not be supported by the under bust band. These should be adjusted so that they neither slip from the shoulder nor cut into the shoulder. All breasts are formed differently and are mostly not equal in size. For this reason, both straps should be adjusted separately so that for example the smaller breast may need to be pulled tighter than the larger. Bust measurement. Wear a non-padded bra and use a tape measure. 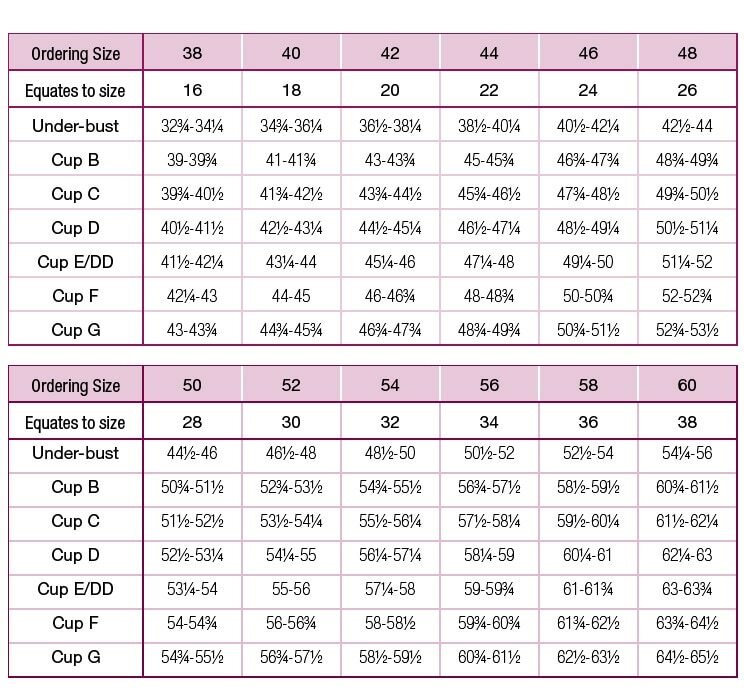 Check your measurements regularly, as the bust size changes with age - and with it your bra size. Pull on your body forming camisole or body from bottom to top in order to achieve the perfect fit. Wear body forming articles without built-in cups with a bra in order to form the optimum cleavage. Close the bra during the wash cycle in order to avoid possible damage. Never dry your Bra in the dryer or lay it over the heating. Hang up to dry.